Comparative compositions of Pluto and friends, even long-distant friends. Continuing coverage of the July 22, 2013 first day of the Pluto Science Conference being held this week in Laurel, MD. Bill McKinnon (Washington University) next provided an engaging talk about implications for composition and structure for Pluto and Charon. Where did Pluto Accrete (i.e. where was Pluto born)? 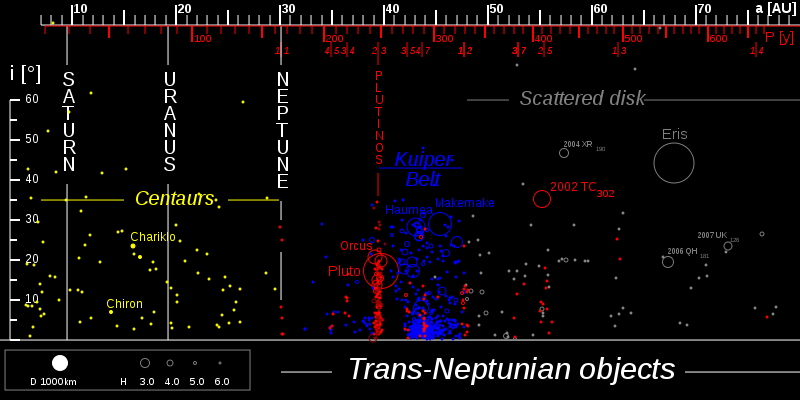 Pluto is not alone in its location on that a/e plot for Trans-Neptunian Objects (see previous posting). It’s part of an ensemble of bodies on the 2:3 resonance with Neptune, coined the group “Plutinos.” Was Pluto formed around 33 AU (Malhotra 1993, 1995) and then migrated outward? What does this Nice I Model (Levinson et al 2008) which migrates the giant planets predict for the KBO population? The Nice I Model implies that for Pluto, Pluto could have formed 20-29 AU (i.e. closer in) to allow it to achieve its high inclination. Then a subsequent model, Nice II (Levinson et al 2011), suggests Pluto may have formed in the 15-34 AU range. This is in okay-agreement with accretion models since Pluto, a 1000-km size body, would need 5-10 million years (i.e. within a nebular life) if it were formed in the 20-25 AU range. McKinnon’s best guess: Pluto formed between 15-30 AU. How long did accretion take and what are the implications (i.e. how long for Pluto to grow up)? If we have an accretion time (10’s of million years), there is time enough to form Aluminum-26, which provides a form of heat through its decay. Heat then can melt ices and create a differentiated body (i.e., rocky core, icy mantle) and also drive water out. McKinnon’s best guess: Pluto formed rapidly and early. What are Pluto & Charon made of? They are understood to be made of rock+metal, volatile ices, and organics, with rock+metal more than ice, and ice more than organics. The rock will be some combination of hydrated & anhydrous silicates, sulfides, oxides, carbonates, chondrules, CAIs (calcium-aluminum-rich inclusions), CHONPS (carbon, hydrogen, nitrogen, oxygen, phosphorus, and sulfur). We don’t really know what sort of composition these KBO volatile ices: will they be more like Jupiter Family Comets or Oort Comets? And we know even less about organic components: will the Nitrogen to Carbon ratio tell us whether KBO N2 (nitrogen) comes from organics rather than NH3 (ammonia)? Solar models (which lock up CO (carbon-monoxide) into carbon) can influence understanding of what rocks in the outer solar system are made of but their models are not in agreement with the best understanding of Pluto/Charon make-up. McKinnon’s best guess: Rock/Ice nature of Pluto-Charon is 70/30. What are the implications for Pluto & Charon internal structure? New Horizons will not directly detect the differentiation state of Pluto & Charon because it does not fly close enough. Alain Doressoundiram (Paris, France) came next. Using MIOSTYS, multi-fiber front-end to a fast EMCCD camera, on a 193 cm telescope in France, they observe outer solar system bodies using stellar occultations. Other science objectives for variable stars, transiting exoplanets. They confirmed two TNO occultation events, one in 2009 and one in 2012 and continue monitoring. Luke Burkhart (Johns Hopkins University) talked about his work on a “Non-linear satellite search around Haumea.” Haumea is another Trans-Neptunian Object (TNO) that has multiple satellite companion, like Pluto. Using HST (10 orbits) they observed the Haumea system and used a method of stacking & shifting to identify satellites. But this method fails to capture objects which are close in, moving fast, and on highly curved orbits. So they developed a new method using a non-linear shift-rate. Their approach, when applied to the Haumea system, had a null-result. However, this approach could be used on images of the Pluto system and other TNOs. Specifically, in answer to a question from the audience, Luke would be eager to use his technique on any of those long-range KBO targets the New Horizons project is currently investigating. 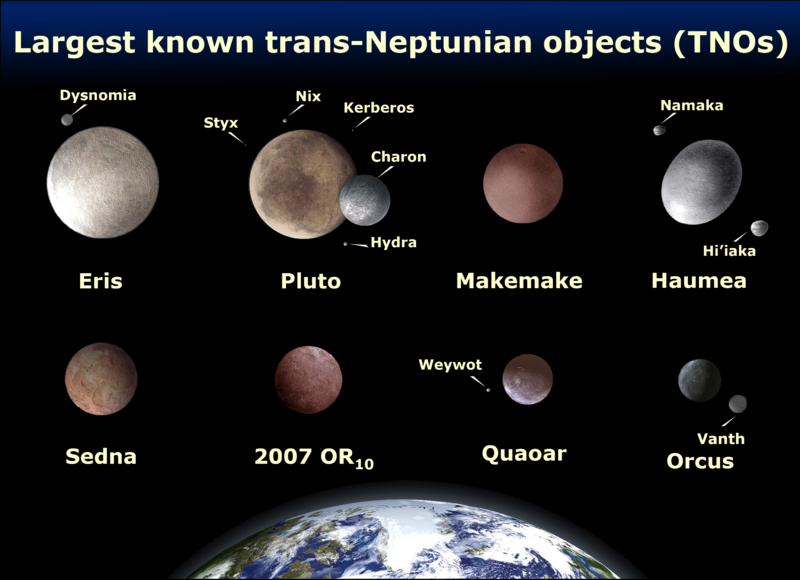 Family portraits of the eight largest trans-Neptunian objects (TNOs) (From http://en.wikipedia.org/wiki/Trans-Neptunian_object). Pluto is shown with its 5 companions. 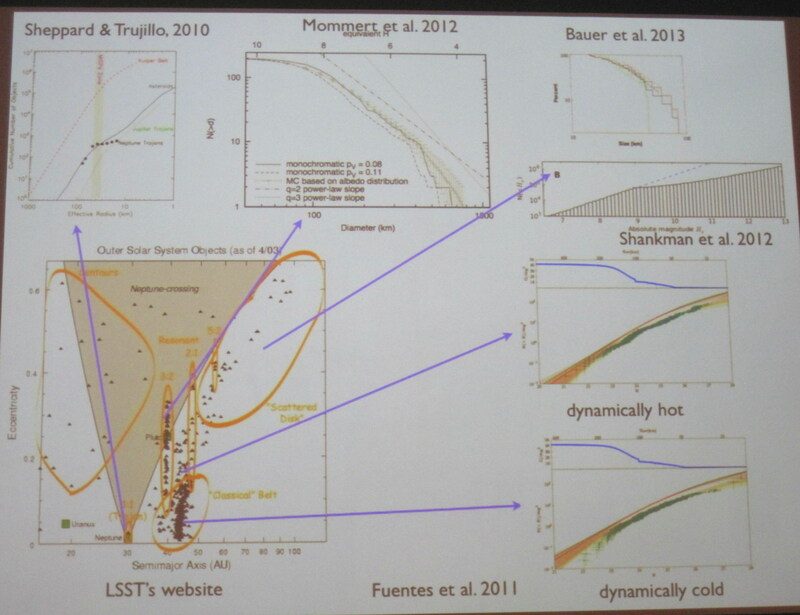 Andy Rivkin (JHU/APL) ended the afternoon’s lively discussion by addressing “Distant Cousins: What the Asteroids Can Teach us About the Pluto System”. He started his talk with a comparison of sizes between Ceres (the largest asteroid in the asteroid belt between Mars and Jupiter) and the Pluto System. He used as his framework Emily Lakdawalla’s chart, which can be found on the Planetary Society blog http://www.planetary.org/multimedia/space-images/charts/relative-sizes-pluto-system.html. Here the relative sizes of objects in the Pluto system are represented by objects from the Saturn system. Saturn’s moon Rhea serves as Pluto, Dione as Charon, Prometheus as Nix, Pandora as Hydra, Helene as Kerberos, and Telesto as Styx. Superimposed is where Ceres (an asteroid in our asteroid belt between Jupiter & Mars) fits on this scale. 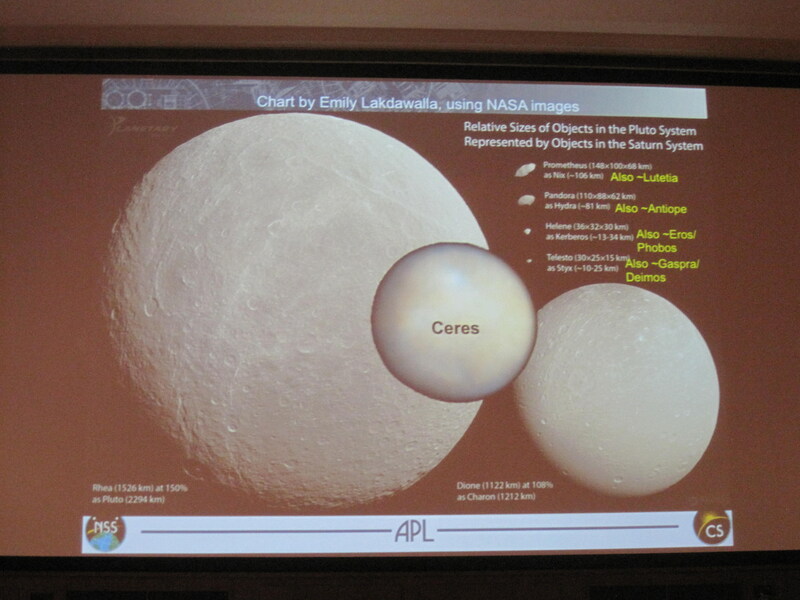 Andy Rivkin did a comparison of his observations of Ceres to postulate what that might mean for the Pluto system. Pluto system and Ceres shown to scale, represented by objects from the Saturn system. Ceres has an icy interior, but much too warm to keep ice on surface. HST images reveals rather smooth surface. IR spectra (from reflected sunlight) are very rich and indicative of ice-type features. Could there some sort of layering? On Pluto, you could have the same thing, but it’s also cold enough for ice to remain on the surface. There is also a mystery that several large C asteroids have similar 3 micron spectra to Ceres like 10 Hygiea and 704 Interamnia. Implications for Pluto: Large main-belt asteroids could serve as comparisons for KBOs. Geophysical comparisons may be easier than compositional ones. So the big take-away from the introductory talks on the “Kuiper Belt Context” is that we can learn more by sharing the knowledge: Learning from Other Bodies (Other TNOs, Comets, Asteroids) will help us learn more about Pluto & Charon, and vice versa. Author Kimberly EnnicoPosted on July 23, 2013 August 1, 2013 Tags Asteroids, Comets, KBO, NASA, New Horizons, Pluto, TNOLeave a comment on Comparative compositions of Pluto and friends, even long-distant friends. Pluto, “King of the Kuiper Belt, Prince of the Plutinos.” Certainly an object that inspires odes, songs, and ballads. 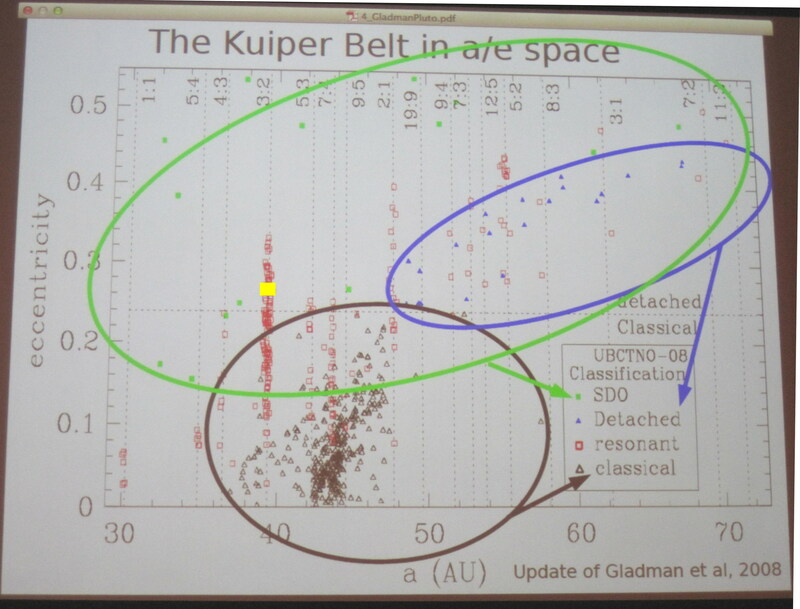 After the New Horizons’ instrument overviews on the first day at the Pluto Science Conference (Jul 22, 2013, we jumped right into Pluto in the Kuiper Belt Context. But before we get into that, discussing the Kuiper belt today can be pretty complex. It was only discovered in 1992, but in the years since, over 130,000 bodies with sizes 100 km and larger have been identified (Petit et al 2011), with Pluto being the largest member. So when we start looking at large numbers of objects, it’s time to classify. So a typical plot to describe these “populations” is shown below, where semi-major axis (distance of body from the Sun) is plotted (horizontal axis, labeled ‘a’ in units AU, where 1 AU is the distance of the Earth from the Sun, Jupiter is ~5 AU, Saturn ~10AU) versus eccentricity (value between 0 and 1 that describes how circular an orbit it, e=0 is circle, e=1 is parabola, 0<e<1 describes ovals). And then you have your Classical, your Cold Classical, Hot Classical, Detached, Resonant, and SDO (aka Scattered Disk Objects), etc. Sometimes they group together, others are more uniform across the parameter space. Kuiper Belt in a/e space.” Cold classical (black open triangles). Resonant Kuiper (open red square). Detached (blue triangles). Pluto is indicated with the yellow-box, it’s a Resonant, as it is in 3:2 Resonance with Neptune. This group of objects, all in 3:2 Resonance with Neptune are the “Plutinos.” (that clumping around 40 AU, red triangles, spanning over a range of e). Resonance numbers are shown at the top of the graph. Plutinos are also a family of TNOs, Trans-Neptunian Objects, characterized by being in 3:2 mean-motion resonance with Neptune (i.e., every time Neptune makes 3 trips about the Sun, the Plutinos make 2 trips). Plutinos are the most dominant of the TNOs. Less numerous are the 1:1 objects, objects known as Trojans. For more information about TNOs and their period relationships with Neptune https://en.wikipedia.org/wiki/Resonant_trans-Neptunian_object. After getting down those nomenclature basics, Brett Gladman (who is also lead for a huge ground-based survey of KBOs called the Canada-France Ecliptic Plane Survey/CFEPS) discussed the strengths and pitfalls of the theories put forward to explain the formation and structure of this complex KBO menagerie. For more information about CFEPS check out http://www.cfeps.net/. How did Pluto get to where it is today? Two leading theories (1) Resonant sweeping of objects formed in TNO regions and (2) resonant trapping explain many things, but no published models explain those resonant structures of the Kuiper belt. And any of these models have issues with the classical and scattering disk populations as well. Theorists, better sharpen your pencils. So he left us with questions to ponder. Is there a cold primordial Kuiper Belt with edge at 45 AU? Did Pluto likely form as one of hundreds to thousands of >1000km embryos? Did some of these become implanted into the nearby non-scattering belt? Are there others out beyond 100 AU (considered likely, but to discover them, you need to get down to 23-24th mag which is beyond the current survey capabilities until new telescopes and.or techniques come available)? No doubt, searches for more TNOs will continue, the classification of the KB will undergo evolution, and theorists will refine their models. And New Horizons will provide a unique data set of an up-close-and-personal visit to Pluto and its companions to help constrain those models. Putting Centaurs and TNOs in Context. This time plotting inclination (the degrees from the ecliptic plane) vs. semi-major axis in AU. Object sizes are reflected in the symbol sizes. Location of Saturn, Uranus and Neptune are shown. Just another way to look at that awesome & diverse Outer Solar System. From: https://en.wikipedia.org/wiki/Trans-Neptunian_object. Next, Cesar Fuentes (Arizona State) phoned in about his work on the “Size Distribution (SD) of the Kuiper Belt.” Size distribution is basically counting the number of objects as a function of size. Coagulation (of small particles) and gravitation instability (of larger particles) shape the size distribution. Size distribution is expected to change due to collisions. Different distances from the sun also appear to have different size distributions. He stepped us through recent size distribution models from Schlichting, Fuentes & Trilling (2013) and Kenyon & Bromley (2013) where they even have some including the “collisional factor” influence on the size distribution over time periods. All the Size Distributions show a “rollover” around H~9, D=70km. Nesvorny et al. 2013 investigates this further. Is the break due to collisional and therefore separate the primordial from the evolved KBO populations? Even more questions to ponder: Can we use size distributions to evaluate primordial from the evolved KBO populations? And then he left us with a tantalizing experiment with the New Horizons mission: If New Horizons can provide data sets enabling “crater counting,” we will be able to measure the impactors on Pluto. This can aid in understanding KBO populations, addressing specifically, formation time, timescales for surface activity, and origins of bodies like Nix & Hydra. What would a 0.1-100 km impactor size distribution look like? Author Kimberly EnnicoPosted on July 23, 2013 August 1, 2013 Tags NASA, New Horizons, Pluto, Solar System, TNOLeave a comment on Pluto, “King of the Kuiper Belt, Prince of the Plutinos.” Certainly an object that inspires odes, songs, and ballads.